Hello, my name is Brian Millager. I have been with Flood Pro for 10 years. Before my opportunity to work at Flood Pro, my professional career has primarily consisted of Project and Product Management roles in Land Development and Manufacturing were I gained valuable experience in planning and implementation of plans and schedules while working with, and directing, multiple skills, trades, and agendas. 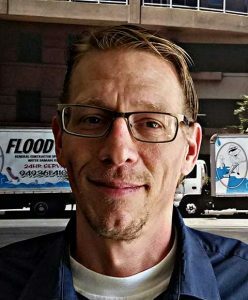 In my time at Flood Pro, I have become very familiar with many facets of water damage, asbestos abatement, mold remediation and returning your house back into your Home. I take pride in the fact that I can facilitate a prompt completion of unwelcomed situations while never neglecting safety, policy/procedures and Customer Satisfaction. In my time away from work, my Family and I, enjoy camping, the beach, the pool and just hanging out together. We appreciate every opportunity you may provide and we strive to return your Home back to normal.